The aerial bundled cables designed for fixed installation as overhead power lines up to 1000 V incl,To supply 120/220V aerial service for tem service at construction sites, as a service drop (power pole to service entrance) as a secondary cable (Pole to pole), or street lighting. For service at 1000V or lower at a maximum conductor temperature of 90℃. Phase Conductor Aluminium conductor, round stranded compressed (RM). 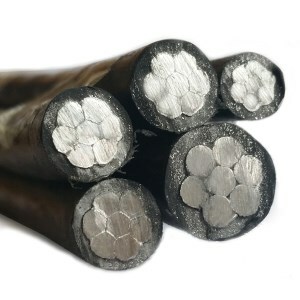 Neutral Conductor Alloy aluminium conductor (AlMgSi), round stranded compressed (RM). Insulation XLPE. Load-bearing / neutral core – marked with standard and producers phase core – marked with digits 1, 2, 3. Assembly Cores and the neutral, conductor stranded together in right-hand lay, additionally 1, 2 or 3 cores of reduced cross section can be co-stranded. NFC 33 209 standard is the standard of abc cable. Nfc 33209 is the specification of French standard. It has been widely used in the Africa and Europe. The most important markets are French speaking countries. In general, nfc 33209 cable is composed of neutral messenger, phase and lighting line. The insulation of nfc 33 209 standard cable are PE, XLPE and PVC. As the the nfc 33209 cable supplier. Huadong Cable Group always put the customer as the first position. In the fierce market competition, selling the nfc 33 209 standard cable to the customer and getting the customer satisfied, it should be the normal market rule to achieve win-win situation. However, in the oversupply market, the supplier of nfc 33209 cable and the customer are unequal. Whether the market is good or not, Huadong Cable Group insist on the quality first, so we can provide the high-quality product for you. Send the inquiry, you can get the best price. In the industry of nfc 33 209 standard, the whole adopts many measures, such as factory spot checks, spot sampling, flight check and linkage pumping. It does make some effect in the quality of nfc 33209 cable. But it still needs to be carried out in a long time. Mature market needs supplier of nfc 33 209 standard cable and customer to develop together. From the current situation of quality control of nfc 33209 cable. In the one hand, all the industry associations do a lot of job to control the industry of nfc 33 209 standard cable, such as purifying the market, building a normal market order and promoting a fair competition mechanism. It helps the nfc 33209 cable to develop a lot. On the other hand, customer should increase the purchasing adjustment. When you purchases the nfc 33 209 standard cable, he should comply with the purchasing rules. The good nfc 33209 cable market circumstance need the mutual working of suppliers and the customer. So when you purchase the nfc 33 209 standard cable, you must be careful. If you choose Huadong Cable Group, you can set your mind at rest. Send the inquiry, you can get the high quality cable with best price. Welcome to visit our factory, leave you message in free, we will send the details to you within 12 hours.